On Valentine’s Day, my parents were married. Not because it was a romantic holiday but rather because the Catholic Church said that day was acceptable. It was January 1947 when my parents found an apartment. That was no easy feat in post World War II in a big city like Baltimore as weddings were often delayed until suitable housing could be located. It was a surprise when they found the apartment. It was too long and too expensive to wait until after Easter to marry, so they married on St. Valentine’s Day. My parents had met only several months before. They were on a streetcar. My shy father was watching my mother, and he came forward and asked, “Aren’t you Jane Graham?” My mother looked up and said, “Yes”. My father introduced himself – or rather reintroduced himself. They had lived just a few houses apart on North Fulton Avenue as children in the – before he moved away when he was about eight years old. My father was coming from the Central Post Office downtown after mailing a letter to a girl he was seeing in Oklahoma. After the Army shipped their troops home from Europe, they not sure what to do with until their service was completed. He offered to go to the Pacific. The Army countered with Alaska. He returned to Baltimore by way of Oklahoma but he had plans to go back. The girl’s father owned a business and was going to give him a job so they could marry. Oklahoma seemed like a nice place. My mother was with her sister coming home from making a novena at the St. Jude Shrine. She was trying to mend a broken heart. According to the Catholic Church, she was not allowed to marry the man she loved and she wouldn’t defy their dogma. She tried to become a cloister nun but they wouldn’t accept her. The Church told her to repair her heartbreak and proceed with her life. She was trying. In addition to the novena, every morning before work, she would listen to two records before leaving the house – “Ave Maria” and “Stormy Weather”. My father asked her out and she agreed. My mother said she wanted to go dancing. They set a time, she got ready, and he never came to pick her up. He stood her up. She was not heartbroken and didn’t think much about him or the broken date. He made contact with her about six weeks later and asked her out again. It turns out that he didn’t know how to dance and was taking dancing lessons. He was also no longer writing to the girl in Oklahoma. They went dancing, began dating, and after a few months, became engaged. While courting her, he tried to give her the stuffed animal he bought for the girl in Oklahoma. He told her it was purchased for the other girl. My mother refused the gift and was not at all pleased by his offering. My father was bewildered that she didn’t want the gift. (He and I talked about it last summer before he died and he was still bewildered about the refusal almost 70 years later. He observed to me with a question in his voice that women don’t like to receive gifts that were bought for another woman. I agreed with him). 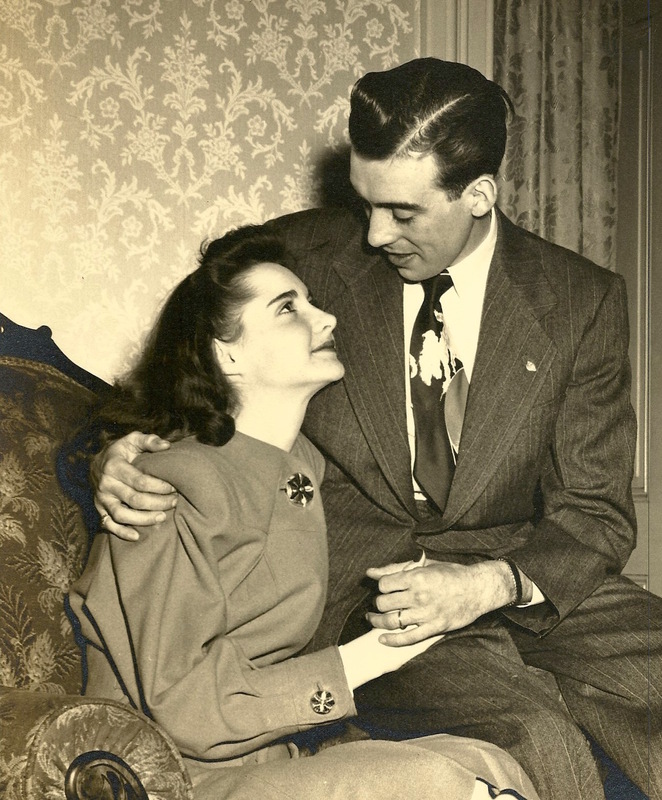 In typical post World War II haste, they became engaged. And almost immediately, an apartment became available. Their rush into matrimony was fueled by the apartment, much like gasoline on a fire. But, it was Lent. The solution was to marry on a Saint’s Day to receive a dispensation. Because everything was sudden and very hurried, many were people counting on their fingers to see if she was “caught”. Even her mother seemed poised to do some finger counting. She said to her daughter, “Of all my girls, you Jane?” They married on a Friday evening after work. When I was little, I wanted a romantic version of my parents wedding, the beautiful white gown, and some sort of magic. It was not to be. My mother was married in a blue suit. I later learned that it was designed and sewn just for her. She carried and wore pink roses and the reception was at her mother’s home. I always has thought that my parents were married in my mother’s home, but it turns out they were married at St. Martin’s Catholic Church two blocks south on Fulton Avenue. They were married in the vestibule because it was Lent. After the ceremony, they walked back to her house for the reception. Perhaps some people were disappointed when counting on their fingers for the next few months. But what most didn’t know was that there was an addition to the new family made between the St. Martin’s and the reception. My mother adopted the first of many stray cats she brought home. The cat’s name is lost to history but the habit of picking up stray pets remains in the family DNA, at least mine. Last year, I had to clean out the house for sale. A house they shared for over 50 years. Much to my amazement, I found her wedding flowers, her headpiece, the cake topper she painted, and their wedding pictures in the attic. There was also the remains of her going away dress. I never knew any of these things existed before last year. In the pictures, I saw my parents as such young adults. I was able to see a tiny peek of the inside of my grandmother’s house, decaying for decades before finally being torn down. All were amazing gifts I never expected to discover. And because these things survived, packed away for over half a century, I suppose there was something romantic in my mother’s wedding after all.